For a long time I though that being Caucasian meant that I had no culture. “Culture” wasn’t a word that I heard (or used) often growing up in Western New York; my friends, neighbors, classmates and I all shared the same ethnicity (more or less) and our foods, holidays, and day-to-day routines were all very similar. And, while this is pretty much the exact definition of culture, the sameness of our culture made it feel non-existent. After high school (and eighteen years without much cultural diversity) I moved to the suburbs of New York City — and, that’s when I first started to think about culture as more than a definition from a textbook. A freshman on a small college campus — where only twenty five percent of the student body checked “White, non-Hispanic” on their application — I was surrounded by teenagers from around the world. By the time I graduated four years later I had friends from Thailand, Greece, Nicaragua, China, Romania, Poland, and Trinidad; I had traveled outside the country for the first time; sat cross-legged in strangers’ apartments listening to live Indian ragas more times than I could possibly count; and had finally mustered up the courage to eat raw fish. I met David during my senior year of college. Like so many other people that I knew, David had deeply rooted connections to a defining set of ideas — ideas that stretched far beyond the time and place in which we existed. David’s family was from the Caribbean and he grew up salsa dancing with his cousins, eating pernil (instead of turkey) on Thanksgiving Day, and greeting people with a kiss on the cheek. David had culture. The fact that I ended up marrying David probably didn’t help my cultural identity crisis; for the past ten years, I have been surrounded by people, all of whom share a common culture— a culture that has, at times, made me feel as though I don’t belong. David taught me to respond “German and English” when people asked me the puzzling “what-are-you” question but it has never really felt like a good representation of the person that I am. And then, last week, I had a thought. Like most of my illuminations, it happened in my kitchen, while I was cooking. I was making a big batch of shakshuka and I started thinking about how similar the dish was to eggs in purgatory — both are basically eggs baked in a spicy tomato sauce; they’re just seasoned a little differently. Or, how similar shakshuka is to Mexican huevos rancheros — except that huevos rancheros are served on a tortilla. Or, Turkish menemen. Or, Spanish pisto. And, on and on. Anyhow, the point is, that all of these different regions took eggs, baked them in tomato sauce, and made a dish that has become a representation of their respective cultures. Culture is, in effect, what we make it — culture is what we choose for ourselves. Sure, most people assume much of their culture from the society in which they were raised or from the practices of their ancestors but, ultimately, they either choose to continue a certain set of practices or they choose to adopt new beliefs, customs, and ways of life. And so, as it turns out, I have just as much culture as anyone else does; I’ve just been conflating culture with ethnicity. And a little bit of heritage. That being said, shakshuka is a dish that has become written into my family’s culture. We may not be of Tunisian descent but we eat a lot of vegetarian meals (and a lot of eggs) and this is something I make on a regular basis. My version is topped with goat cheese (because it’s one of those ingredient that I just can’t get enough of) and fresh cilantro (we always have some on hand — it’s a key ingredient in Latin cuisine) but many of the other flavors in the tomato sauce are traditional: garlic, cumin, paprika, and chili pepper flakes. I like to serve it with freshly baked pita bread — it’s perfect for sopping up the spicy tomato sauce. Drizzle a small amount of oil into a large, enameled, cast-iron Dutch oven (if you don’t have a Dutch oven, you can make this recipe in any oven-proof skillet but make a half batch) and heat the oil over medium-low heat. Add the onion and peppers and cook slowly, stirring occasionally, until soft, about 15 minutes. Add the spices and cook until fragrant, about 30 seconds more. Then, add the tomatoes and all of their juices. Season with salt and pepper, stir to combine, and bring to a simmer. Allow the stew to simmer until thickened slightly, about 15 minutes. When the stew has thickened, taste it and add more salt or pepper, if needed. Then, crumble the goat cheese and sprinkle it all over the top of the stew. Using a spoon, make 8 indentations in the stew. Crack an egg into each of the spaces. Cover the pan and pace it in the preheated oven. 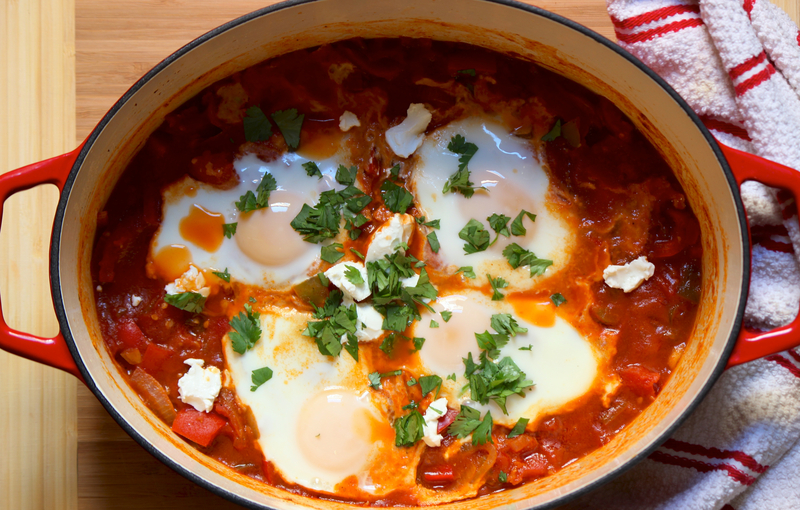 Bake the shakshuka until the eggs are just set and the yolks are still runny, about 6-7 minutes. Garnish the shakshuka with cilantro and hot sauce and serve with bread.